February is a good month to drink Merlot. Although we’re still caught in the icy grip of winter, the grip is loosening. The days, while still cold, aren’t as cold as they were; and they are getting noticeably longer. Best of all, Punxsutawney Phil did not see his shadow this year on Groundhog Day! So, while February is still a good month to drink rich, full-bodied red wines, I find a Merlot, which is often silkier than its half-sibling, Cabernet Sauvignon, particularly appealing. Lately, I have been drinking an old favorite, Kenwood Jack London Vineyard Merlot Sonoma Mountain. The Kenwood website indicates that this single vineyard, single varietal wine is produced from vines planted in red volcanic soil on Sonoma Mountain. The vineyard land, once part of Jack London’s Beauty Ranch, has a southeastern exposure and lies above the fog line. This location allows the vines to receive morning sun exposure that is tempered by cool afternoon breezes. The grapes for the 2014 vintage were harvested between September 24 and 27, and fermented in stainless steel for three weeks. The resulting wine was aged in French and American oak barrels for eighteen months before being bottled in April 2016 at 3.51 pH, 7.0 g/L total acidity, and 14.5% alcohol. This Merlot is deep red, with tart cherry and chalky aromas on the nose and dark cherry, chocolate, cola and chalky notes on the palate. It has a medium to full-body, with pleasant acidity and good tannic structure. The finish is long and relatively complex. On the Kenwood Vineyards website, Jack London Vineyard Merlot Sonoma Mountain retails for $28.00, and the wine club price is $22.40. However, it is on sale at O’Bryan’s for $19.99 per bottle. A good single vineyard, single varietal wine at this price is a great deal. Stop by O’Bryan’s and pick up a bottle. Just prior to Christmas, I was assisting a customer who asked if we had Twenty Rows Cabernet Sauvignon in stock. The look of satisfaction on his face as he placed four bottles into his cart made me curious about the wine. I researched it online later that day and found some favorable reviews, so my wife and I tried it at O’Bryan’s with some friends. It was so good that we ended up drinking a second bottle and one of our friends bought the last one to take home. Twenty Rows is a second label of Vinoce, a boutique winery with a vineyard on Mt. Veeder. The North Coast bottling is mostly Cabernet Sauvignon with smaller amounts of Merlot and Petite Sirah. It is aged in French and American Oak and has an alcohol content of 13.5%. This highly pigmented wine is deep garnet in the glass. It opens with aromas of cassis, vanilla, and graphite. The body is medium to full, with notes of cassis, dark cherry, blackberry, leather, vanilla, and earth. However, the fruit-driven profile is balanced by acidity and a fine tannic structure. The finish is long and complex. 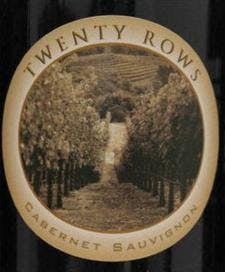 At $24.99 per bottle, Twenty Rows 2016 Cabernet Sauvignon North Coast is a lovely way to bring some California sunshine into the Midwestern, midwinter doldrums. We currently have it back in stock at O’Bryan’s, but I don’t expect the bottles to collect much dust. I have some good news for the Pinot Noir lovers among us. We were finally able to get some Haden Fig 2015 Willamette Valley Pinot Noir in stock at O’Bryan’s Wine and Spirits. I have known about this wine for several years, but I was never able to get my hands on any of it. Then, in July, I tasted it at a distributor portfolio show and loved it. We tried to get it in stock at that time, but it has been unavailable until now. Haden Fig is the original label of Erin Nuccio, the owner/winemaker of Evesham Wood Winery in Oregon. The 2015 Willamette Valley bottling consists of 1525 cases and is blended from equal amounts of fruit from Cancilla, Croft, and Bjornson vineyards. The grapes are organically grown and go from vineyard to bottle without manipulation. The must is fermented with native yeasts and the only cooling system in the winery involves opening and closing the doors. This is an example of natural winemaking at its finest. This wine is a pleasingly bright, clear, garnet color in the glass. It leads with a light nose of tart cherry. On the palate, the body is light to medium, with both tart and dark cherry notes, raspberry and dark fruit. It is moderately complex, with medium acidity, silky tannins and a medium-to-long finish. The alcohol content is 13.5%. At $21.99 per bottle, Haden Fig 2015 Willamette Valley Pinot Noir is a very good Oregon Pinot Noir at an even better price. We currently have a case of it in stock and I hope that we can get some more; but I can make you no promises. In closing, I want to leave you with the lone note that I made to myself about this wine in the portfolio tasting book this summer: BUY THIS!! Niner Red—There’s Still Time for Some Full-Bodied Wine! I know that many people prefer light-bodied rosés during the warm months, but there are still a few cool evenings left—and that means there is still some remaining time to enjoy a full-bodied red wine. If you feel likewise, you should try the 2015 vintage of Niner Red. This wine is a blend of nine estate-grown varietals consisting of 35% Cabernet Franc, 14% Merlot, 14% Syrah, 10% Cabernet Sauvignon, 8% Grenache, 8% Mourvedre, 7% Malbec, 2% Petite Verdot, and 2% Barbera. The people at Niner hand-picked the grapes from three vineyards, Heart Hill (western Paso Robles), Bootjack Ranch (eastern Paso Robles), and Jespersen Ranch (Edna Valley) and then hand-sorted them at the winery. They used gravity feed for the juice and aged the wine for fourteen months in French and Hungarian oak, thirty-eight percent of which was new. Some of you may be wondering about the presence of methoxypyrazine, the bell pepper flavor that is common in many wines made from Cabernet Franc and its descendants. Have no fear; there are no pyrazines here! The grapes were obviously ripe at harvest (26°Bx), thus reducing the presence of pyrazines, but the wine, while fruit-forward, has some complexity and does not cloy. It opens with a nose of blackberry and black cherry. On the palate, these flavors are joined by black currant, chocolate and a hint of black pepper. They carry through to a medium-long finish. Niner Red is an enjoyable wine to drink on its own, yet it will pair very well with barbecue, grilled foods, and other summer fare. At $19.99 per bottle, I think you will be very pleased. Stop by O’Bryan’s and pick up a few bottles this week. Above all, have a great summer! The vernal equinox, which marks the astronomical first day of spring in the Northern Hemisphere, was right on time this year. However, it seems as if Mother Nature still has some winter left on her plate and she is taking her time with it! While I would ordinarily be thinking about a lighter red or maybe even a rosé for this post, there is obviously some time left for a larger-styled red wine before it gets too warm. With that in mind, I want to introduce you to a wine that is both a delicious everyday drinker and a remarkable bargain—Sean Minor Four Bears Cabernet Sauvignon, 2016. The Four Bears is a value-oriented line of wines named as a tribute to Sean’s four children, but make no mistake—these wines deliver on quality and the Cabernet Sauvignon is no exception. Instead of being a decent porch-pounder, I found the Four Bears Cabernet Sauvignon to be a wine that I wanted to savor; and it rewarded my patience with a constantly evolving taste profile. In fact, I found it downright uncommon for a wine that costs less than $15.00 to be this interesting. When I inspected the bottle, I noticed the pleasantly low alcohol content of 13.5% ABV. This is especially notable as the wine is from Paso Robles, an AVA known for warm temperatures and ripe fruit. In the glass, the wine had a deep garnet hue, with definite notes of cassis, a pleasant herbal quality, and a hint of truffle on the nose. However, it evolved in thirty or so minutes, with much of the herbal and truffle notes being replaced by violet and plum. Upon my initial taste, I got cassis, of course, with the slight herbal quality, dark cherry, and dark chocolate. Later, as the wine opened, I detected additional notes of blackberry and plum. It had a medium-to-long, fairly complex finish. Sean Minor has truly hit the ball out of the park with this one. I recommend that you stop by O’Bryan’s Wine and Spirits and try it for yourself. We have a very nice covered patio, which is enclosed and heated during the cold months, where you can relax after work and enjoy a glass. I hope to see you there! Napa Cellars 2013 V Collection St. Helena Cabernet Sauvignon – It’s Like Christmas in January! I want to inform you of a tremendous bargain that is available for a short time at O’Bryan’s Wines and Spirits: Napa Cellars 2013 V Collection St. Helena Cabernet Sauvignon. Napa Cellars is a subsidiary of Trinchero Family Estates that is most well-known for its Classic Collection of wines, produced from a combination of estate-grown and sourced fruit and aged in French oak barrels. They are good quality, regionally representative wines that are affordably priced in the eighteen to thirty-two dollar retail range. However, the next tier up, the V Collection, is produced with a completely different focus. It consists of vineyard-specific, 100% varietal, limited-production reserve wines with retail prices in the forty to fifty-five dollar range. As with the Classic Collection, these wines also represent very good value in their price bracket. 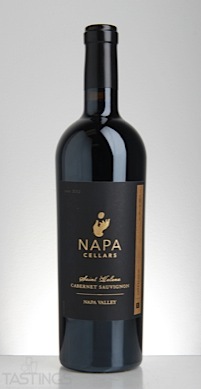 Napa Cellars’ winemaker, Joe Shirley, produced the 2013 V Collection Cabernet Sauvignon from their estate vineyard in St. Helena, which is planted to an equal mix of clone 7 and clone 337 Cabernet Sauvignon grapes. The growing season for this vintage was characterized by warm, stable weather conditions that resulted in a long hang time and full ripening of the fruit. The 1200 case production of this wine was aged for twenty-four months in French oak barrels, of which 46% were new. I had the pleasure of sharing a bottle of St. Helena Cabernet Sauvignon with my wife. This is a medium-to-full-bodied wine with a highly pigmented, deep red color. The nose and palate are characterized by black cherry and blueberry flavors, with floral notes of violet and hints of leather and vanilla. The long, fairly complex finish is balanced by silky tannins and pleasant acidity. We found it to be delicious upon opening, but it continued to develop and improve over the course of the evening. I saved the best part of this for last. The 2013 vintage of the V Collection Cabernet Sauvignon is currently available from the winery for fifty-five dollars per bottle. However, you don’t need to break the bank to drink it because we have it on sale at O’Bryan’s for only $27.99! This is nearly fifty percent off of the retail price. To make this deal even better, there is also a mail-in rebate! You get five dollars back for every two bottles you buy, up to a maximum of thirty dollars for a twelve-bottle purchase. As I indicated above, it’s like Christmas in January! The 2013 V Collection St. Helena Cabernet Sauvignon is likely to fly off of the shelf at this price, so come in soon and get a few bottles for your cellar! The days are noticeably shorter and the nights are becoming long and cold. For the last week or so, I have been driving to work and returning home in the dark without even working any extra hours. Yes, winter is here! All of these short days, long nights, and low temperatures have put me in the mood for a savory stew, laden with meat and root-vegetables, and served with a rich red wine such as Viña Alberdi Rioja Reserva, 2010, from La Rioja Alta. La Rioja Alta is a highly-regarded winery which began production in 1890. In her 1008-page compendium of wine knowledge, Wine Bible, Karen MacNeil listed this bodega as one of the region’s finest producers. Viña Alberdi Riserva is made from 100% Tempranillo grapes grown during an exceptionally good vintage in Rioja. It was aged in American oak barrels for two years; the first year in new barrels and the second in barrels which had an average age of three years. This beauty is deep garnet in hue, with great clarity. The nose opens with dark cherry, red currant, plum, black pepper, some licorice, and a hint of vanilla. These aromas carry through to the pallet, with good tannic structure and tart acidity. The body is medium-to-full, with a fairly long finish, while the alcohol content is a mere 13.5% by volume. 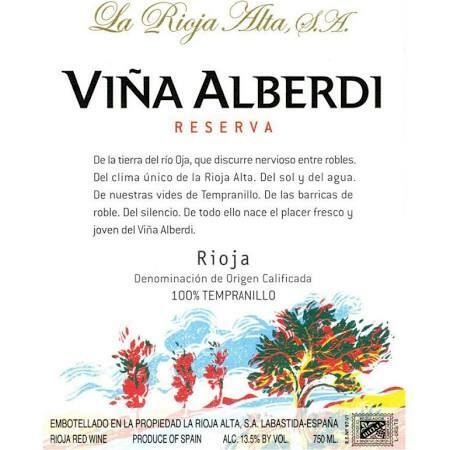 At $19.99 per bottle, Viña Alberdi Rioja Reserva is a great wine. It is reasonable enough that it can be consumed over a good week-night dinner, yet it is high enough in quality that even the pickiest wine drinkers will have difficulty finding fault with it. James Suckling gave it a score of 95 points and referred to it as being “very finely crafted.” Likewise, Robert Parker’s Wine Advocate gave this wine a score of 91 points and called it “delicious.” You can find out for yourself as we currently have a good supply on-hand at O’Bryan’s Wine and Spirits. I sincerely hope that all of you have a blessed holiday season. Anne Amie Winemaker’s Selection Pinot Noir—A Thanksgiving Go-To! Halloween has already gone by. The days are noticeably shorter, the leaves are reaching their full fall glory, and there is a chill in the air. These all mean one thing to me–Thanksgiving is approaching! In fact, as I write this, we are only twenty-one days away from that fantastic feast when we give thanks for the bounty of the previous year. The traditional dinner, as we all know, consists of turkey, stuffing, mashed potatoes and gravy, green beans, cranberry relish and pumpkin pie. The most common question I hear from customers at this time of year is, “Which wine do I serve with it?” Indeed, the array of flavors that one experiences nearly simultaneously in a meal of this size and diversity can make it difficult to find a wine that doesn’t clash with something on the plate. If you prefer red wine, as do I, one go-to for Thanksgiving is Pinot Noir. Obviously, there are many Burgundies out there which will work, but, in keeping with the origin of this holiday, I like to serve an American alternative. If it is very good, affordable, and produced from 100% estate-grown fruit on a property which is environmentally conscious, I like it even better. If the winery philosophy is such that the wine comes from efforts in the vineyards rather than from excessive manipulation during production, I’m batting a thousand! 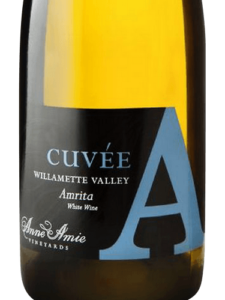 Folks, I’m here to tell you that I have found a Willamette Valley Pinot Noir which meets the criteria–Anne Amie Winemaker’s Selection Pinot Noir, 2015. This translucent, ruby-colored wine has a perfumed, floral nose of violets and sweet cherries. It is light to medium in body, with good acidity, flavors of cherry and red berry, and a hint of black pepper on the finish. An added bonus is the moderate alcohol content of 13.4%. The good availability and reasonable price of $25.99 per bottle should make this an easy choice for your Thanksgiving meal. Please stop by O’Bryan’s and grab a couple of bottles. I think you will like it! I will close by wishing all of you a blessed Thanksgiving holiday.